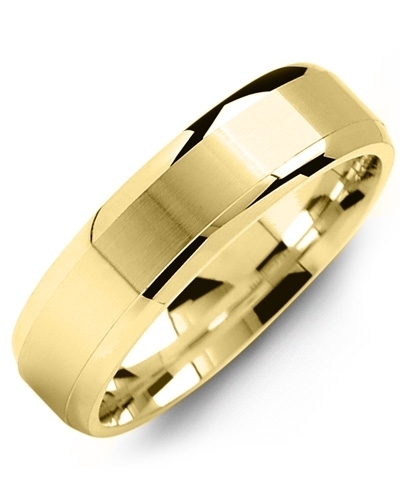 MNU - Dome Brush Polished Edges Gold Wedding Ring If you are looking for a classically designed wedding band with a contemporary twist, this Dome Brush Polished Edges Gold Wedding Ring could be it. Simple, stylish, and sophisticated in design, it features a dome shaped band with brushed detailing and polished edges for contrast. Offered in white and yellow gold, 10kt, 14kt and 18kt options, and various widths so that it can be personalised to complement your jewellery collection. If you are looking for a classically designed wedding band with a contemporary twist, this Dome Brush Polished Edges Gold Wedding Ring could be it. Simple, stylish, and sophisticated in design, it features a dome shaped band with brushed detailing and polished edges for contrast. Offered in white and yellow gold, 10kt, 14kt and 18kt options, and various widths so that it can be personalised to complement your jewellery collection.